Sailor Boy was chosen and named while he was just a little egg. He arrived home in April of 2004 after weaning . 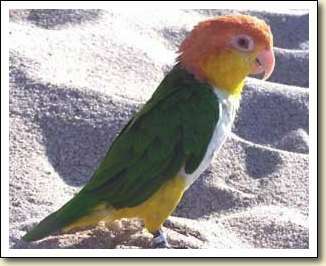 Soon after arriving, he began training as an outreach bird with the Long Island Parrot Society. He especially adores young people and entertains them with his toys and funny antics. Quite by coincidence, his older sister Chiquita needed to be re-homed and she came to join him in the spring of 2005. She was potty trained in her first home and she is trying to teach Sailor Boy. Their days are filled with endless play, and I can't imagine life without them. Sailor Boy and Chiquita live with Gloria on Long Island, New York. 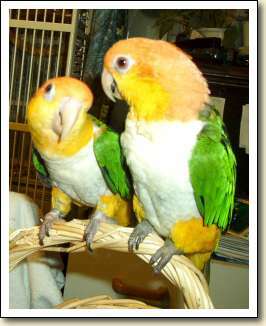 Toby (the handsome male caique on the right) arrived by airplane from Shady Pines late July 2004. We found him at the airport sitting up straight & tall waiting for the next chapter of his life to begin. We took one look at him and it was love at first sight. Toby LOVES to eat, play, sing in the shower and keeps his eye out for birds flying by outside. He now has a friend, Jada, to share his home. They adore each other, yet always find plenty of time to share with us. It's very normal to be found walking around the house with two caiques hanging on us, or surfing our necks or shoulders, much like having a free massage. Toby is quite the character...strong-willed - yet so very loving. He has been a happy, healthy bird right from day one and we cannot imagine life without him. Toby lives in NH with Rick & Sue. Buddy arrived from Florida in the spring of 2002. He is extremely good natured and makes friends where ever he goes. He likes going to the beach, mountain biking (in his flight suit), car rides, slumber parties (he's always a big hit), hanging around in the back yard, and loves being scratched. His very favorite activity is cuddling with us. He's great with kids, he loves my daughters and their friends. 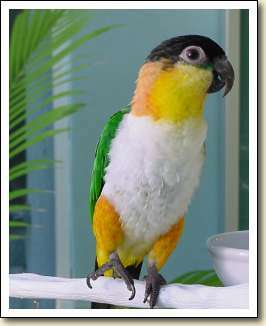 Thanks to Gloria at Shady Pines for not just a wonderful Caique, but a good friend for the whole family. We love him! Buddy lives with Kathy and her daughters on the north shore of Long Island, New York. These two little ones, Willow and Sydney, are my hearts delight! So gentle and affectionate and BUSY. They like to be where ever I am and try to get involved in what ever I do which leads to some crazy antics (especially folding laundry) and tons of laughs. Here is an example of their fascinating character. Some months ago I was teaching Sydney to whistle the tune of "the Mexican Hat Dance," we would hear him when he was alone actually practicing all by himself. Imagine that? He has since mastered the tune (well mostly) and we are now working on the Seven Dwarves tune "Hi Ho Hi Ho" I will never part with these little guys for my life would be dull indeed! Willow and Sydney live with Maryann and Jim in Pennsylvania. Hi! My name is Bandi (my official name is Bandit). 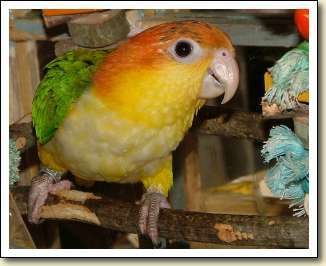 My hatchday at Shady Pines was April 9, 2000. My Mom and Dad came and picked me up in July 2000. I LOVE to eat (most everything) and I love playing with toys. I am a cuddly girl and I LOVE showers! I could play in the water all day, but Mom won't let me! That's okay, cuz I like towel surfing after!! I say quite a few things, like: "Hi!," "Baby Up!," "Yup!," and Mom's favorite - "I love you!" :) Don't get me wrong, I am ALL caique - full of adventure, curiosity, wanting my own way, and getting into trouble!! 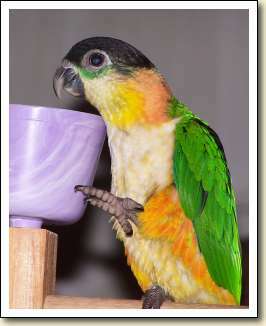 I live in Southwest Florida with my 3 fid siblings and my parronts - Lin and Matt. My name is Mia. I hatched on March 25, 2002. After flying into Newark airport from Shady Pines, I was brought to my lakeside home. I like laying on my back and kicking my feet. I love to hang around on Dan's shirt while he does chores around the house. When I'm tired of Dan, I just latch on to my buddy Aja's collar - she's my Doberman by the way, and hitch a ride from room to room. Aja is so patient with me when I 'beak' her ears. She returns the love with a great big Doberman lick. My favorite foods are pistachio nuts and grapes. I've also grown very fond of corn on the cob. Mia lives in North Branford Connecticut with Dan. At six years old, Pandora is still the party girl. She's cheeky, beaky, a little loud at times. "What's the racket!" But, she loves to surf on Mom and Dad and get her head skritches (watch out for those pin feathers!) when she's not living up to the song "Girls Just Wanna Have Fun." Pandora lives on the west coast of Florida with Pat. This is Pajaro & Squeaky. 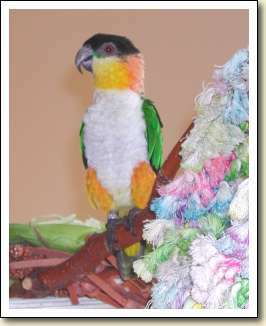 Pajaro was my first bird and so much fun we wanted another! 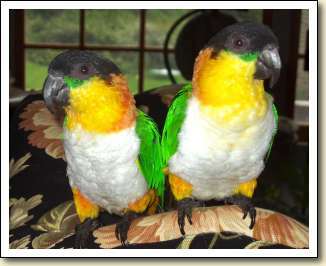 Squeaky (on the right), was just 5 mos. when she was shipped from Shady Pines in November 2000. Squeaky got her name because when she came to us, she seemed to squeak rather than chirp or squawk. Now, though she can certainly squawk! She loves playing on her back, wrestling, bathing and surfing over their toys to dry off, and her favorite activity, eating!! They love sharing time with us in their outside cage too! She's very bonded to Pajaro and always wants him close by but loves to spend time with us too. 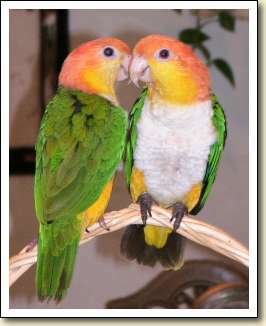 My caiques are my only birds that can be handled by just about anyone. Pajaro and Squeaky live in Dallas with Jeri. Hi yall. I'm Lily. I am proof positive that "caiques just wanna have fun!" 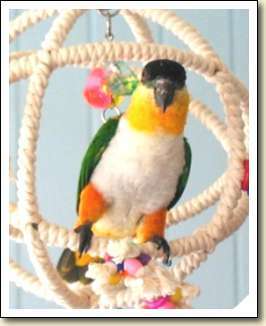 Almost a Valentine, my hatch date is 2/13/04, and I'm almost perpetual motion in feathers. I and my best-buddy, Boo (a female BHC), begin our morning routine by following our pet human, Faye, out to the kitchen, where we sit on the counter and watch eagerly while breakfast is prepared. Ah, nothing starts the day better than fresh apples, oranges and broccoli! Yum! it's off to the playroom - shh, don't tell our pet human - she thinks it's her bedroom, but since all our toys are in it, it's officially OURS. I live in Birmingham, Alabama, but I'm far from a shy little southern belle! 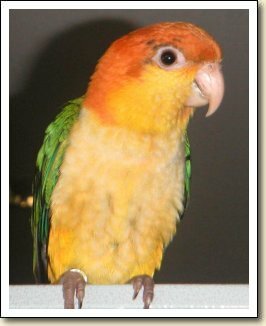 Lydia is my second Caique - she arrived August 5, 2004. I also have Tattoo, a male. We are hoping they become very good friends. Thank you Gloria so much for providing us with such a sweet, healthy, well-adjusted baby. Thanks again. Lydia lives with Clare in Lexington, Kentucky. Hey everybody! My name is Mango! Aren't I cute? My H-day is April 2, 2002. I'm an Aries! I get to eat fruit, vegetables, and seed any time I want. My favorite fruits are red grapes and plums. My favorite thing to do is to try and chew on my Dad's glasses, but he always stops me from doing this! I love all of the attention and I'm so spoiled! My cage has a Peek-A-Boo top in it, so my Mom opens it so I can sit there all day long...what a life I have! Life is great at my new home, and I know I will live a long, happy life here! I live in California with Wendy, Tom, and Krystal. 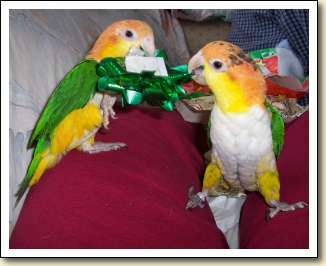 This is Zachary and Daisy at eight months old, enjoying their first Christmas. They love to play! 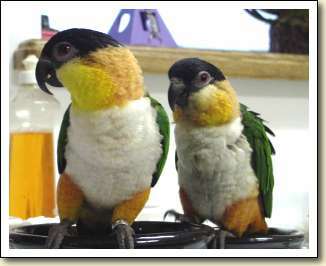 They get along well with our black headed caque, yellow naped Amazon and the cockatiel. They have brought new joy and excitement into our house. Zachary and Daisy live with Debbie in Michigan.